Choose Web, Options, Open, and then Select. 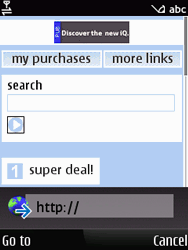 BASE corner is loaded, the BASE web address for mobile users. Visit BASE corner for a complete overview of BASE's most popular services, tips and promotions for your mobile phone. Choose Go to web address, and then Select. Choose Go to to load the website. 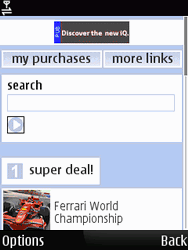 Choose the search box, enter search criteria, and choose Search to perform the search. Choose Options, Save as bookmark, and then Select to bookmark this site. Check the bookmark name, and choose OK. The bookmark has been added. Choose Bookmark manager, and then Select. 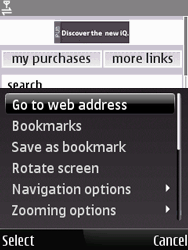 Choose Add bookmark, and then Select to add a new bookmark. Under Name, enter The Phone Book. Under Address, enter http://www.thephonebook.co.uk/, the The Phone Book web address for mobile users. Choose Options, Save to bookmark this website. Choose The Phone Book, Options, and then Page to load the website. Choose one of the links to find a telephone number, or choose Help if you need assistance. ChooseOptions, Go to web address, and then Select. Choose one of the links to open the relevant news category. To stop using the internet, choose Options, Exit, and then Select.